Your pond edges, with the rocks and branches looks very natural, and they are thickly palnted. 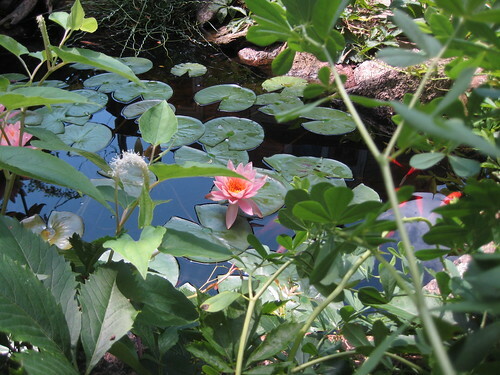 The waterlily blooms are beautiful, the perfect topping for the pond. In the last photo, as the the goldfish rush over to the edge, it does look like they associate food with you. Any human gets the goldfish love these days – the heat has them hungry! I love the pond. I wish I had room for one, we do put plants in our fountain and they look great but not the same as a pond. You’d be surprised about how small our lot is and how small the pond is! 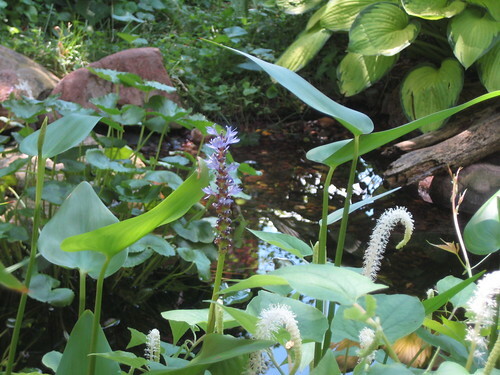 The MPKS pond tour is coming up in 3 weeks (I’ll post details this weekend), so please feel free to visit then to see some small-yard ponds. Another lower maintenance alternative is a pondless waterfall. They’re pretty neat! 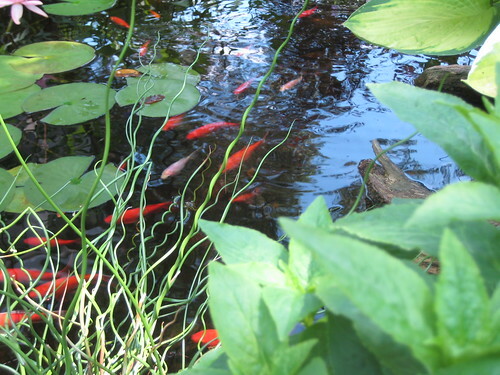 Your pond is so pretty; it must be peaceful to have it in the yard. Hey, did I see you at the Halsted blue line stop the other day? I would have said hi but then remembered I know who you are but I don’t think you know who I am! That’s my work stop – was it morning or evening? Please do say hi if you see me again! I tend to space out during commuting (good thing I don’t drive), but I’d love to chat with a fellow gardener.